I know pancake day has (literally) just been and gone, and everything is sounding less waffley, and more pancakey, but we love waffles. We have waffles or pancakes every Saturday morning, but sometimes we just can’t wait until Saturday, and we have them on a Friday instead. 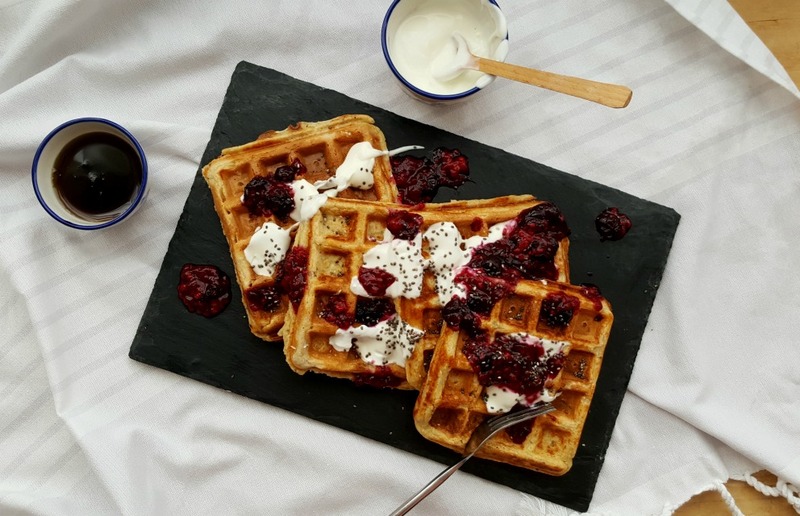 This tradition waves ‘Hello’ to the weekend, and always feels pretty exciting, so today I’m sharing our go-to waffle recipe. For the top – a handful of blueberries, and a handful of raspberries plus a little water, and a dash of maple syrup. For cooking – coconut oil. 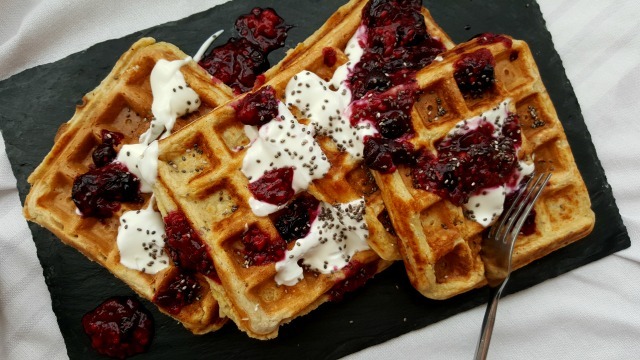 Plug in your waffle iron, add a little coconut oil and switch it on. Place the raspberries, blueberries, water and syrup in a pan over a low heat, stirring every few minutes, and mashing the berries gently. Blitz the oats in a food processor, or blender for around 20 seconds until it becomes a course flour. Add the dry ingredients to the oats, and give it a good stir – baking powder and chia seeds. In a separate bowl whisk the eggs. Then add the milk, natural yoghurt, syrup and lemon zest and stir well. Add the wet ingredients to the dry ingredients, and mix until thoroughly combined. Once the waffle iron is hot and ready, use a ladle to scoop the mixture onto the iron. Let the waffles cook until you are happy with them – I like mine quite ‘well done’, so I do two heat cycles. 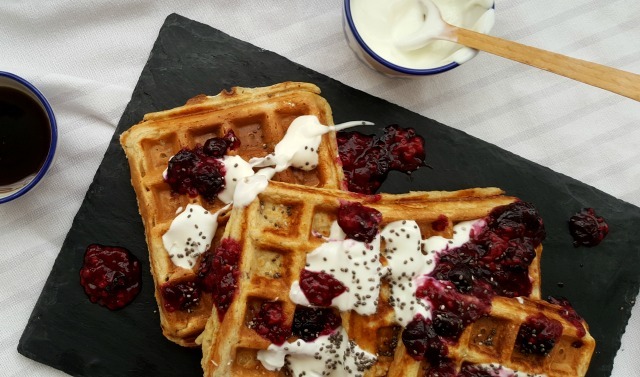 Place the cooked waffles onto a plate, spoon the warm berries over and drizzle with more maple syrup. Tip: The mixture will slowly get thicker as the oats soak up moisture, so you may need to add a little more milk…and please don’t omit the lemon zest, it makes them taste delicious! Ooh these sound fabulous! I use coconut milk and it just gives everything a really fresh taste, I much prefer it to normal milk. I think I need to invest in a waffle iron! Absolutely going to try these! !